To kickstart the summer this month, Sunseeker will share the finest photography of its world leading luxury performance motoryachts across social media channels as part of #SunseekerSummer. Throughout the month of June Sunseeker will share a different image every day across its Facebook, Twitter and LinkedIn platforms with the #SunseekerSummer hashtag. The images will feature its entire range of stunning motoryachts in exotic locations across the globe. Customers and followers can also get snapping themselves and share their own photos using the hashtag to show how they are enjoying the summer. Whether it be on board their own Sunseekers, with friends or admiring the beautiful boats they aspire to own one day, everyone can join in and bring some glamour and sunshine to their social media activity. Commenting on the campaign, Sunseeker's Marketing Manager Bryan Jones said: "We're looking forward to getting the summer off to a fun start with #SunseekerSummer and encouraging as many people as possible to connect with us and share the brand on social media. It's a great way to showcase Sunseeker's entire range throughout the month of June, and the first few posts have already driven some great engagement." 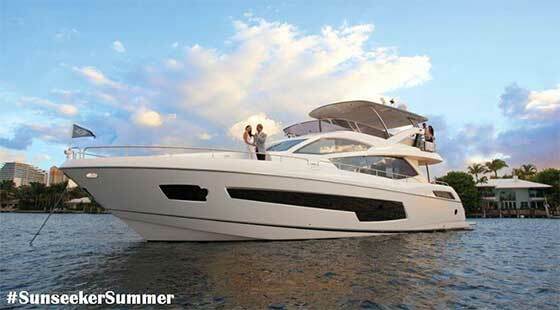 Sunseeker is the world's leading brand for luxury performance motor yachts.